A flock of Subway mandocellos. These longscale electric mandolins have a wicked sound. 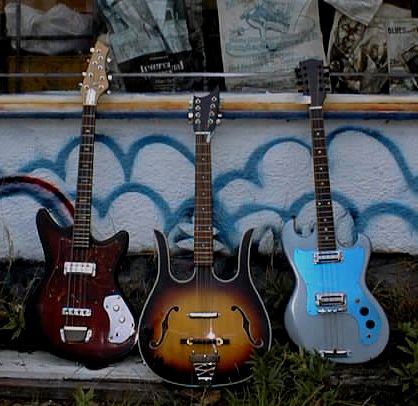 The longhorn (middle) illustrates the potential for the left-handed. We've made a number of them. The redburst one (left) $225, the longhorn lefty (middle) $325, come with many permutations. We make a five-course model for a little more. The metallic blue with iridescent pickguard sports dual Ric toaster pickups, $325. 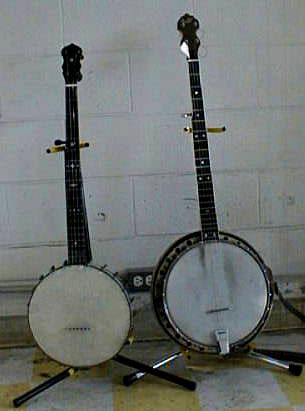 60s Framus 5-string banjo. Good tone ring, fancy resonator. Play Dixieland at Octoberfest for only $300. 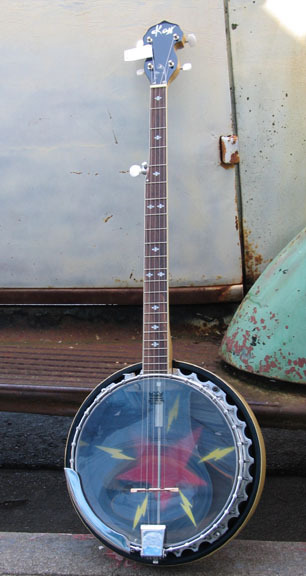 Your eyes will BLEED from pearl glare on this ultra-deluxe 5-string banjo replica. from the 1930s. Lists for $1800, but its yours for $600. 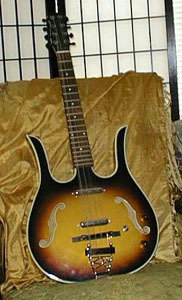 Solid spruce top F-5 mandolin replica. Ornate pearl inlayed fretboard. Bargain. $500. 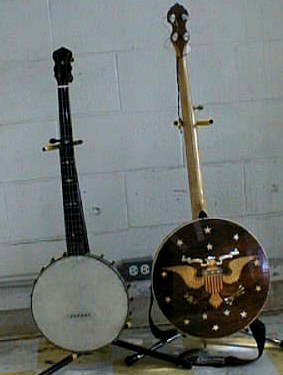 6-string banjo. We don't know where this came from, but its COOL! Sounds good. $225. F-hole mandolin. Carved top. Sunburst. $200. I understand your concerns about buying a guitar over the Internet. You can't put your hands on it. You don't know what it'll look like, what it'll sound like, how it will feel. Then there are the issues surrounding shipping anxiety: "Will it arrive undamaged?" "When will it arrive?" "WILL it arrive?" The concerns go on and on: "What's the tracking number?" "Will you ship it today?" "When will you ship it?" "Can I get it tomorrow?" Your purchase will definitely arrive in good, undamaged condition AND in a timely manner. Your purchase is insured against damage in transit. If you don't like what you've ordered, you can return it within two weeks of purchase. You have the option of a full CASH refund or a trade-in for something else you like. All you pay is the return shipping, which amounts to about $10 within the Continental United States. "Experience Ecstacy" for a week with your new guitar. If the instrument is not what you expected, then expect a full refund on merchandise returned in the condition of purchase. Fatdog considers this the backbone of good biz (and happy customers). NOTE: There is no refund for shipping. Trade-ins are seriously considered at a high value.